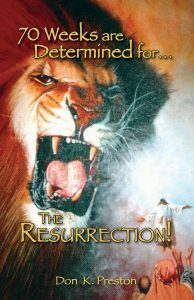 Daniel's Seventy Week Prophecy of Daniel 9: Bringing In Everlasting Righteousness - Impossible Under Antiochus Epiphanes! The Seventy Week Prophecy of Daniel 9 was fulfilled in AD 70! The Seventy Week Prophecy of Daniel 9:24: Bringing in Everlasting Righteousness – Impossible Under Antiochus Epiphanes! Before I get into the body of this article, I want to point out that in my previous article, I pointed out that the Antiochan view demands that Daniel 9 is speaking of 3 “princes” but, that in that paradigm, not one of them could do what the text of Daniel demands, i.e. make the atonement, take away sin, and bring in everlasting righteousness. In “response” (if you can call it that) Sam Frost concurred that Daniel does speak (demand) of three princes. He listed them as Cyrus (who made the decree to rebuild Jerusalem, Onias III the slain high Priest, and Antiochus. As I noted in a response to Frost, Not one of these men did – or could do – what the text of Daniel 9 demands! Not one of them! Cyrus was not a priest, nor was Antiochus! And, Onias was killed by Antiochus’ henchmen before the Temple was desecracted, thus, he did not do those things to restore the temple and cultus! Thus, Frost’s “response” is totally specious and untenable. His suggestion reveals how desperate his new theology has forced him to become. Consider this: The Seventy Week Prophecy of Daniel 9 foretold the establishing of everlasting righteousness. I suggest to you that this is prima facie proof that Daniel 9 is truly Messianic in the fullest, most wonderful sense of the word. According to the unbroken testimony of scripture, the arrival of the Messianic Kingdom would be when righteousness would be established. Isaiah said that when the kingdom came, the king would rule in righteousness (32:1) and that the Lord would place righteousness and salvation in Zion (Isaiah 46:13). When the Old “heaven and earth” passed away, the Lord’s righteousness would prevail in the kingdom (Isaiah 51:6f). The Davidic king and his kingdom and rule would be characterized by righteousness (Jeremiah 23:5; 33:15). This keynote word for the Messianic kingdom is contrasted, particularly by the New Testament writers, with the futility of life under Torah. As Paul said: “Is the law then against the promises of God? Certainly not! For if there had been a law given which could have given life, truly righteousness would have been by the law” (Galatians 3:20-21). “Sin, taking opportunity by the commandment, produced in me all manner of evil desire. For apart from the law sin was dead. I was alive once without the law, but when the commandment came, sin revived and I died. And the commandment, which was to bring life, I found to bring death. For sin, taking occasion by the commandment, deceived me, and by it killed me. Therefore the law is holy, and the commandment holy and just and good” (Romans 7:7-10). Paul could say that Israel’s failure was, in fact her attempt to find – to achieve – righteousness by law keeping instead of by faith (Romans 9:32-10:1-3). Righteousness, simply stated, could never be established by or under Torah. The Seventy Week Prophecy is perfectly harmonious with these other true Messianic prophecies in its prediction of the coming world of righteousness. This is the “restoration of all things” that Peter said all the OT prophets foretold. This is the righteousness that Paul anticipated in Galatians 5:5. It is the New Creation, the New Heavens and Earth that Peter longed for, and that would be the fulfillment of God’s Old Covenant promises (2 Peter 3:13). What this means is that when Daniel 9:24 foretold the coming world of everlasting righteousness, it must be seen as a prediction of the long anticipated Messianic kingdom, in its fullest sense. Everlasting righteousness could not – ever – be established under the Old Covenant age. It could not be established by Onias or any of the OT high priests– period. The suggestion that Daniel 9 is about the turbulent time of Antiochus is simply untenable on this one single tenet alone. One must ignore, dismiss or redefine the coming “everlasting righteousness” in a way separate and apart from all other true Messianic prophecies of the coming New Creation, in order to sustain a non-Messianic interpretation of Daniel 9:24f. One final thought here, and that is throughout the OT, the coming world of righteousness is posited at the time that the Old Covenant Jerusalem would be destroyed, and the New Jerusalem established. In Isaiah 65, the Old Creation is destroyed, along with the people that spurned the Lord’s gracious calling of repentance and obedience (65:1-2). As a result of that rebellion Israel would fill the measure of her sin (through violence) (Isaiah 65:6ff). As a result: “The Lord God shall slay you and call His people by another name” (Isaiah 65:13f) The Old Creation, along with the Old Jerusalem, would pass. The identical tenets and elements are found in Isaiah 66. The rebellious people, the defiled temple, the sinful city would be destroyed, giving rise to the New Heavens and Earth – the world of righteousness. We thus have the destruction of the Old people, the Old City- and by extension – the Old Temple. This is precisely what Daniel 9 foretold. He foretold the coming judgment on the City, the People and the Temple – in total destruction, but, the arrival of the world of everlasting righteousness! Now, it is significant that Paul directly quotes from both Isaiah 65 and chapter 66 to speak of his ministry, Israel’s rebellion, and the implied coming judgment (Romans 10-11). And of course, Jesus had foretold that Israel would fill the measure of her sin – through violence, and be destroyed- in his generation. Thus, Isaiah’s prophecy of the coming total destruction of the People, the City and the Temple, leading to the New Jerusalem is patently Messianic in application. This concept of Two Jerusalems is found in many Old Covenant prophecies. I discuss and document this motif in my Who Is This Babylon? book. So, what we see then is this: Daniel 9 foretold the coming in of everlasting righteousness at the time of the destruction of the People, the City and the Temple. Make no mistake, that did not happen when Antiochus desecrated the city and temple! With the killing of Onias, any “righteous” High Priest disappeared. As I have noted, Menelaus was a killer, cruel, dishonest, immoral. He was thoroughly unqualified to make the atonement, put an end of sins and bring in everlasting righteousness! Following Menelaus was Alcimus, who was, like Menelaus, a murderer, and almost equally immoral, dishonest and cruel as High Priest. According to 1 Maccabees, he was not even of the proper High Priestly line, anyway. He claimed to be of the proper lineage, but, Onias is generally recognized as the last of that proper line. Now, what is fascinating is that in the first century – certainly among the Essenes – there was the belief that the High Priestly office had been so defiled, so degraded for so long, that there were no qualified High Priests, and therefore, the entire Temple cultus was, to them, totally defiled. This means that the High Priestly line – such as it was – from Onias onward simply could not make the atonement, put an end of sins and bring in everlasting righteousness. Daniel 9 could not be fulfilled by any Jewish High Priest from Onias onward! Do you catch the power of that? But, there was a fully qualified High Priest – Jesus – who was totally qualified to make the true Atonement (Hebrews 9), to put an end of sin (Hebrews 9:26), to bring in everlasting righteousness through the New Covenant! It is more than fascinating – and significant – that Jesus never spoke of the -re-establishment of the Levitical / Zadokite priesthood to restore the Temple Cultus! He was the one to fulfill what all of the OT prophecies of the coming world of righteousness pointed to! So, what the text of Daniel demanded could not be fulfilled since everlasting righteousness could not be established by any restoration of the Old Covenant Temple, with its ineffective sacrifices, or, by the revival of Torah observance, since righteousness was not obtainable through Torah. Not only that, with the death of Onias III, the duly qualified priesthood seemingly died out. The “High Priests” who followed him were disqualified either through lineage, or, through their disqualification via violence, immorality, cruelty, dishonesty! They simply could not make the atonement, put an end of sins and bring in everlasting righteousness. But, the ultimate, the True High Priest, did come! He made the Atonement. He put away sin. He brought in everlasting righteousness, and that righteousness is to be found in him. He fulfilled Daniel 9– to the T! The Seventy Week Prophecy of Daniel 9 was all about Jesus and his work, the work that he has completed. The Seventy Week Prophecy is about Jesus and the time of the end – Not Antiochus Epiphanes!